Written by Ed Cardona, Jr.
Bushwick was called home by locals long before any magazine called it hip. Bamboo in Bushwick explores gentrification in this suddenly trendy neighborhood from divergent angles. As a group of old friends gather for a round of dominoes, outside forces converge on their street corner. In an alternate reality, inspired by the psychedelic murals that have taken over many walls in the neighborhood, a turf war breaks out on the icy tundra. Is there room in Brooklyn for both penguins and polar bears? When your community is threatened, every block is worth fighting for. 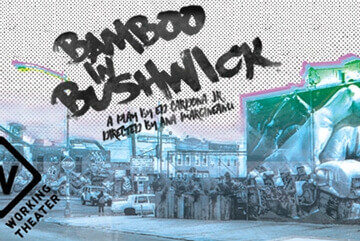 Bamboo in Bushwick is part of Working Theater’s Five Boroughs/One City Initiative. The play was developed in partnership with Riseboro (formerly Ridgewood Bushwick Senior Citizens Council /RBSCC), and through conversations with their members and members of Bushwick Salvation Army Community Center, El Puente Bushwick, Make the Road New York and the general Bushwick community. March 2016 at RBSCC, facilitated by Tamilla Woodard. Young adults between the ages of 13 – 19 and seniors 65 or better were invited to a workshop where participants wrote, interviewed and dialogued to create a collaborative original play.